Martin Jordan braves the skies to cover the action. 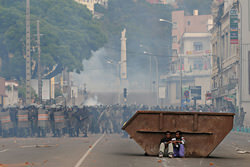 I had been looking forward to my trip to Cannes on the Cote d’Azur to cover the Sony World Photography Awards. When ePHOTOzine asked if I wanted to go? I replied quickly, just in case they changed their mind. 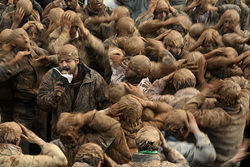 Photo by Music category winner Mohammad Golchin. Photo by Current Affairs category winner Walter Astrada. Now a volcano seemed to be putting the whole trip in Jeopardy. ‘The Volcano’ (as everyone seems to refer to it, it’s real name looking like a bunch of random letters chosen on ‘Countdown’.) had wreaked havoc on travel plans of winners, journalists and organisers alike. I’m disappointed the tabloids haven’t given it a derogatory nickname, such a pain in the neck richly deserves one. However just in time the air space was declared open, the safety bar having been raised, seemingly because the airlines were losing too much money. So we flew out the next day. Only three intrepid journalists braved the ash, which left us being out-numbered by the lovely people from Sony. When I say three journalists, I really mean two and me. I couldn’t help feeling that I didn’t quite deserve to be there; that somehow I would get found out. We arrived at the Majestic Hotel, overlooking the sea and I’m told one of the best hotels in Cannes. There was enough gold decor in the lobby to make P Diddy feel at home. As I waited to check in at the bling-encrusetd front desk, I noticed the other two journalists seemed to be taking it all in their stride. I took their lead and covered my excitement with what I hoped was an air of nonchalance. After padding along the corridor, I opened the door to my room, stepped in and promptly sunk up to my neck in the deep, deep pile. My eyes took in the room and I let out a ‘whoa oh!’ I’d been bottling up since arriving at the front desk. This was a suite! It had sofas, two TV’s, a writing desk, and a balcony. The bed, the size made for threesomes, looked inviting with 8 pillows and the finest Egyptian cotton. The bathroom was huge with 2 sinks, a bath and a shower. The sheer opulence was quite breath-taking. Surely there had been a mix up? I unpacked and spread my things about, like a Tom Cat marking his territory. This was mine now, no one was going to take it from me. Not a lot of chance to relax in the room though as we were working to an action-packed schedule. Photo by Professional Fine Art - Landscape winner Peter Franck. After a very agreeable lunch with an endless supply of chilled Rosé, the three of us attended our first press conference. The Judges were there to talk about the competition. However they seemed to mainly talk about themselves in rather halting English. I soon found myself struggling to keep my eyes open, a couple of times I drifted from the fast lane to the hard shoulder, but I think I got away with it. As we came out, I turned to my new journalist friends and whispered ‘god wasn’t that boring!’ ‘No!’ They both replied, they’d found it really interesting. Oh dear, I’m sure I had now confirmed their worst fears, they had an imposter in their midst. I made a mental note to keep my stupid opinions to myself, and only sip on mineral water next time. 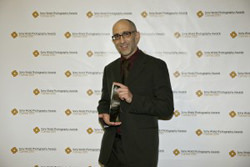 The Sony World Photographic Awards is arguably the largest and most important awards in the industry. With the black tie award ceremony held in Cannes, it’s certainly the most glamorous. Think Hollywood but without so much plastic surgery. In fact this is probably the nearest I’ll ever get to an Oscars ceremony. It had a red carpet, a celebrity MC who was comedian Marc Dolan, a presenter for each category and sealed envelopes for that ‘and the winner is’ moment. Thankfully there were no long speeches or tears. In fact most of the winners seemed only to say ‘my English is very bad….Thank you’, and of course a few were missing due to the V word. The Brits seemed to be over-represented by the presenters, and under-represented by the talent. English was very much the lingua franca with no concession to the French hosts at all. When a winner actually accepted with a ‘Merci beaucoup’, an ironic cheer went up. Like most competitions, I never agreed with all the judges’ decisions, some were brilliant, some left me asking why? Have a look here to see all the shortlisted entries and the results. The top prize the L’iris D’or, was won by an Italian Tommaso Ausili for the Contemporary issues category titled Hidden Death. This was a graphic set of images taken at an abattoir. I thought a very worthy winner of the $ 25,000 prize and Sony digital equipment. Next day we got a chance to interview the winners at another press conference. Now this one was interesting, it’s always fascinating to hear photographers talk about their work, ideas and ambitions. 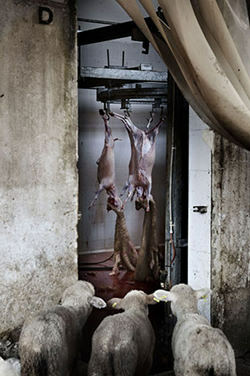 Have to say, 9.30 in the morning was a bit early to look at Tommaso’s shots from the slaughterhouse. As I sat there looking at the dismembered pigs on screen, it was enough to put me off my full English. At this point I saw my chance to redeem myself in the eyes of the journalists. I stuck my hand up and asked what I hoped was a searingly, get to the nub, question: "Were the owners of the slaughterhouse, wary of his motivation? Did they need much persuasion to let him shoot?" The only problem was Tommaso didn’t understand me. I hope they realised this was due to his English and not my question being unintelligible. Tommaso went on to say he was trying to inform people of the disconnect between a nice steak and the reality of killing an animal to provide it. He also said that although the images were shocking, the time spent at the slaughterhouse was short. Therefore he felt In terms of animal welfare it was more important to focus on the animal’s quality of life. Another interesting speaker was fellow Brit Martin Brent who had won the Advertising category. 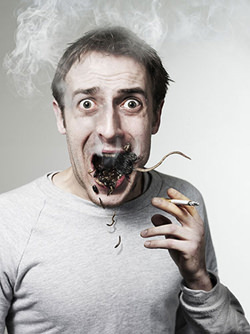 He had carried out shots for an anti-smoking campaign with a difference. The message wasn’t about not smoking, but that if you must smoke; don’t smoke counterfeit cigarettes. They have all sorts of nasty ingredients in them, including rats and bugs. Photo by Advertising category winner Martin Brent. To keep the advert truthful Martin went on to say that they had used real rats, worms and cockroaches. Hardly believing my ears, this time I kept my question simple, ‘did you just say you used a real rat!? He did. That knowledge makes you look at the picture again with renewed fascination and revulsion. A Powerful set of images and a deserved winner. Photo by Fashion category winner David Handley. After the press conference, it was time for lunch and a bit of sightseeing. Paul Genge, Technical Field Sales Manager for Sony UK gave us cameras to play with. Paul has had a camera in his hand since he was two! I’ve never met anyone quite so enthusiastic about photography and cameras. This is a man who truly loves his work. And in his spare time? He runs two camera clubs…the man’s obsessed! I enjoyed messing about with the cameras especially ones so feature packed as Sony’s. They really do seem to be moving the technology forward, ‘pushing the envelope’ as a marketing man might say. The compact I had, was the DSC TX7; this has the sweep feature, an amazing way to take a panoramic shot in one click. Paul loves this feature so much he insisted I use it on a shot of our motley crew. Paul, it’s a great feature, but not suitable for every shot! Sony’s Alpha A900, a DSLR, felt great to use, with the controls being very intuitive. Looking at the spec. it’s right up there with the best. I can’t vouch for the image quality though, as it turns out my universal card reader is not quite so universal. Another amazing camera from Sony is the Bloggie. This camera is at the fun end of the market for stills and HD video. It has a flip lens for filming yourself and friends, and most impressive of all it’s capable of filming 360 degrees! Paul demonstrated by placing the camera in the middle of our restaurant table and filming all of us at once. Cue everyone immediately becoming very self conscious; we obviously hadn’t had enough wine! 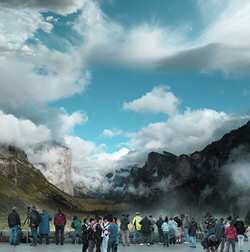 The Sony World photography awards are one of the most comprehensive photographic competitions in the world. It was an honour to see the judge’s selections from over 80,000 professional and amateur submissions from around the globe. British talent did seem a little under represented, and rather extraordinary not one woman received a gong. So if you’re British or a woman or both, what are you waiting for? I know from looking at the galleries, we have the talent. I would love to see someone from here do well. If ePHOTOzine need me to fill the breach once more, to boldly go, where others feared to fly, I’ll do it. Even if I have to pretend to be a journalist. Thanks for another fine read Martin. You have a way with words, and a special sense of humour, so please, stick to rosè and speak your mind. (Gah, slaughter house photo, and rats in the mouth - yuck, but yes, powerful photography). I'm so pleased the fact we were using real (dead!) rats and bugs was noted, great write up. Most people just assume we faked it but I can cast iron guarantee everything you see in the image is 100% real. Our young lady was also a non smoker... the red eyes hardly needed any additional work. Hope you enjoyed the festival as much as I did. Really glad you liked the piece, great to read your comments. Perhaps I should have qualified it was a dead rat! Well done on winning the award, very much deserved.